As we are continually and violently pushed out of public spaces, the people of this city must find new spaces in which to foster dialogue, learn and engage politically. Private spaces must be liberated; the movement must expand. We students, educators and members of the broader public have come together to occupy this space, seeking to transform it into a place of public education, safe and open to all. We reiterate that this occupation is not a New School action; this building actually belongs to Wells Fargo, whose role in the current economic crisis is well-known. 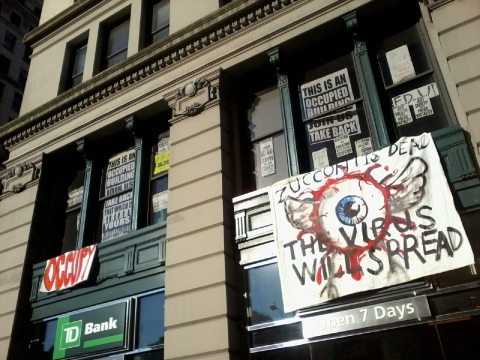 We are occupying a building: and we, as occupiers, are not solely students – we are workers, teachers, students, unemployed, under-employed, indebted and exploited. We are creating a common space that will eventually be open to all. In addition to the people’s university, the CUNY adjunct project, and the all-city student assembly, we are in the process of planning a series of open teach-ins and events. Schedule forthcoming. This entry was posted in Democracy, Politics and tagged #N17, #OccupyWallStreet, 90 Fifth Avenue, All City Student Occupation, Education, Freedom, New School, New York City, revolution, Union Square. Bookmark the permalink.